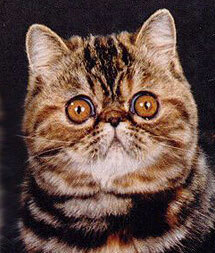 Occasionally... very occasionally... a cat will be born who is destined to changed the face of its breed. To reach this status a cat must be ahead of its time - a cat of exceptional quality - a cat able to stamp its quality consistently onto its progeny. 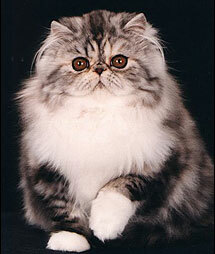 In the Persian breed, there are three cats that have been landmark sires - a solid, a bi-color and a tabby. 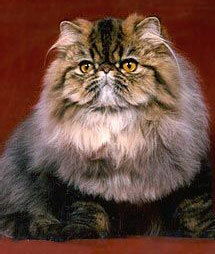 GC Lullaby Abracadabra of Midas, DM, was a black male Persian who paved the way to the modern look of the show Persian, stamping his kittens with his incredible head structure and producing more than 50 grands. 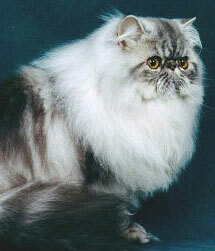 The second sire to achieve legendary status is the blue and white male Persian, GC Anz Nicholas Nickleby, DM. 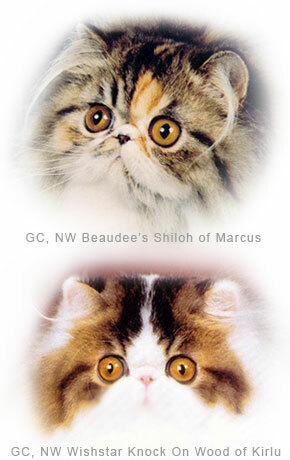 As of January 2005, Nicholas is the highest Grand producing sire in the Persian breed and more than any other single cat, he is responsible for the quality and popularity of the Calico and Bi-Color Persians of today. His prolific siring abilities were instrumental in the foundation programs of countless bi-color breeders. 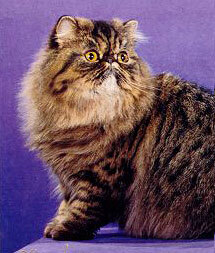 And finally, the third of the benchmark Persian sires is the brown tabby male, GC, RW Red Sky Wooden Ships, DM. strongly influenced the Bi-colors, Himalayans, and Exotics of his day. 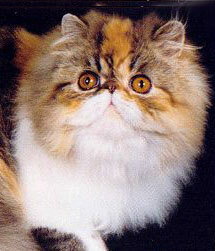 In 1992 the female Persian, GC Marhei Ginger Elle, co-owned by CFA judge Gary Powell and his good friends Charles and Sue Helmke of Marhei fame, was bred to GC Willefred's Excaliber, a one show grand. 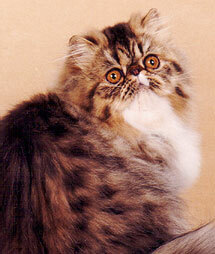 The breeding produced three kittens in April, 1992; a black male, a brown tabby male and a brown tabby female. The black male was sold and became a one show grand. The female went to Marhei. Gary kept the brown tabby boy for himself. Little did he realize at the time the legacy the little brown kitten would bequeath to the Persian breed... for the kitten would grow up to eventually become GC, RW Red Sky Wooden Ships, DM. The kitten was nicknamed "Woody" and it quickly became apparent he was special. He had a wonderful head, incredible pattern and phenomenal warmth to his undercoat. His physical quality was enhanced by a laid back personality and an outstanding show temperament. "Woody is one of the sweetest cats I have ever had the pleasure of knowing. He makes biscuits and purrs continually while I am bathing him and I have to put my face down to his so he can push his mouth all over my face. He does bring a smile to me." 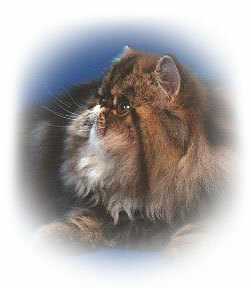 Woody debuted in the show ring as a kitten and was an immediate star. Gary wanted to campaign his beautiful tabby boy, but was too busy with judging assignments. Good friend Linda Berg of Oakheaven Himalayans stepped forward and offered to help. 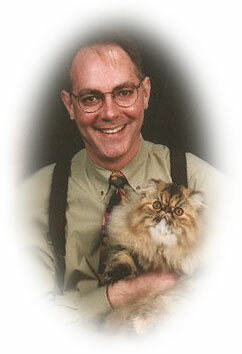 Under Linda's guidance Woody was campaigned to the 4th Best Kitten in the Midwest Region for 1992-93. He then became a 1-show grand, with 285 points in the last weekend of January, 1993. With just three months of the season left as an adult he also earned the title of 22nd Best Cat! Woody was a double regional winner! But it was not in the show ring that Woody would leave his greatest mark. He retired to stud :-). And it is as a sire that he would become legendary. As his first litters were born, it was quickly obvious that Woody was a homozygous agouti tabby! All his kittens in every litter he sired were tabbies! That's wonderful news for a tabby breeder. Woody not only produced tabby kittens exclusively, he was consistently passing on his best qualities - wonderful pattern, warm color and an outstanding head. As Woody became producing as a sire, Gary made the decision to share him with other breeders. 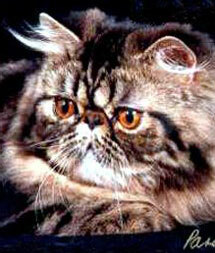 It was this generosity that would change the face of Tabby Persians in CFA. And so it was that Woody was "loaned" to various breeders throughout his breeding career. 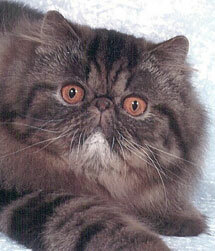 Indeed, Woody sired kittens for Persian, Exotic and Himalayan catteries. 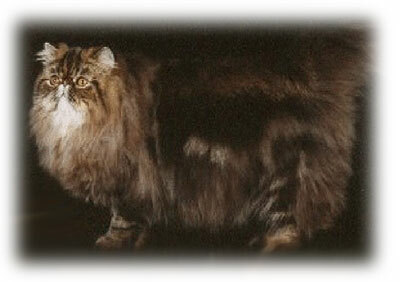 Special mention must be made of Woody's contribution to the establishment of the Lynxpoint Himalayan as an accepted color in CFA. 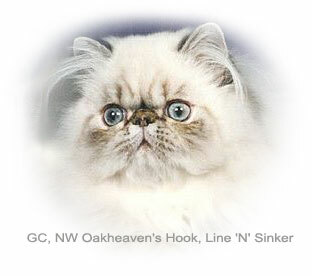 In August 1993 Woody produced a tabby colorpoint carrier son called GC Oakheaven's My Ship Came In. This Woody son would forever change the face of lynxpoints at a time when they were only just gaining acceptance as a new color in CFA. Indeed, Woody's influence on the lynxpoint Himalayan is best demonstrated by the fact that he is the grandsire of the first lynxpoint national winner, a phenomenal male Himalayan called GC, NW Oakheaven's Hook, Line 'N Sinker.